1)Create a new project, name TabHostDemo. 5)Create another 3 layout for Home, About, Contact Activity, name activity_home, activity_about, activity_contact. 6)Do optional activity for change tab images on selection.Create ic_tab_home, ic_tab_about, ic_tab_contact. Please feel free to post your testimonials regarding my work here. Please leave your review by clicking on comment below this post. I have followed all the steps as above..i added a onTabChangedListener() event to the TabHost. I am updating a TextView during tab change. but the view is not displayed. Can you help? Yes you should use OnResume() method for update text..
Reason is that in case of Tab change life cycle of activity not working. I mean onCreate() method never call. So write your text change code inside OnResume(). just copy paste same as in my demo..
for import missing package in your class hope it will help you.. This is very good post but you can also give the workspace of all project in a zip format and a download link. Thanks Kuldeep, but in case of zip code no one going to comment on my blog and for more traffic I need some comment on my post and after 100 comments I do same. I put my code on GIT, any one can download it from there, You can check my popular blogs a download link there.. Thank You manish.But I dont want to display any tab to be opened when TabHostActivity is called.After clicking the tab only it has to display the respctive activity.Is it possible? I am just confused what you want? you don't want any tab? then why you are using Tabhost activity? i have tried your code...manish...but i dont knw what exactly happening..my code doesn't work..! It should work! What error you are getting? Its up to you tam..
And put images in xxhdpi folder also..
Hey im getting an exception thrown when trying any kind of tab layouts. I do have a main activity screen that I do log on to before going to my next Intent please help. barant2003@gmail.com if you have the time chat thank you. And for open HomeTab from after log on please call TabhostActivity in Intent. Hey, I am implementing jfeinstein's sliding menu.. I also want to have a tab activity on the same screen but I can't extend TabActivity because my activity is already extending SlidingActivity.. How do I work around this? Need help so bad!! 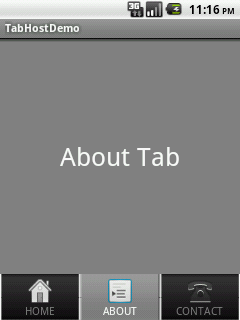 In this case I think you should not use Tab Activity, use Android Action bar. Search for vidio application on google play store. 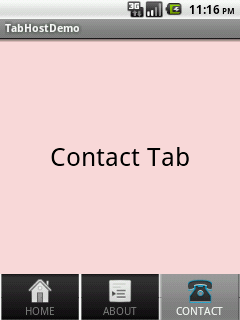 Thank You manish, the tab app works fine :). but I don't get the icon showing if I have a label. the icon only shows when i remove the label. 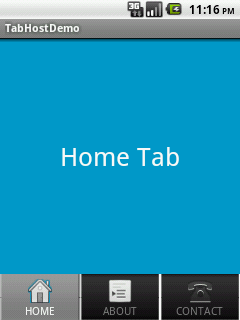 In holo theme, the tab only support label or icon and mutually exclusive. If you willing to both label & icon at the same time, there are two options. Hi Manish, thanks for a wonderful blog tutorial. How can move the tap layout and imagines to the top? sorry dear xml posting is not allow so i remove all tag please add yourself. Hi Manish, thanks for the reply, when are you going to start tutorial on Action Bar? i think its gonna be much than Tabs. Yes you are right dear. sure I will when got some spare time..
Hi Manish, just one question, is it possible that we remove all taps we navigate to a new Activity? i.e we display new Activity but without taps being displayed. Hello, I did everything it works but i cant see images on tabs. What is it's reason ? I am using sample code you have provided above but the Tabs Text is shown and the Icons Not shown. using above the Text of tabs is shown and if I change the .setIndicator("BOOKINGS", to .setIndicator( " ", then the Icon shown but text not shows, I want to show both text and its icon on Emulator AVD. how can i change the label color of a tab when pressed?? Where you are trying to do this?